Why do we stick by Google and Apple but not Microsoft? 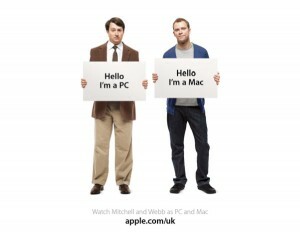 I image that you have probably seen the Apple ads which are based around the two characters: Mac man and PC man. They have been released in various different countries with different actors playing PC and Mac. The campaign which was known as the ‘Get a Mac campaign‘ was broadcast in North-America, the UK and in Japan, as well as on the web. In the USA Mac was played by Justin Long, whilst PC was played by John Hodgman. In the UK, comedy duo David Mitchell (PC) and Robert Webb (Mac) took the role. 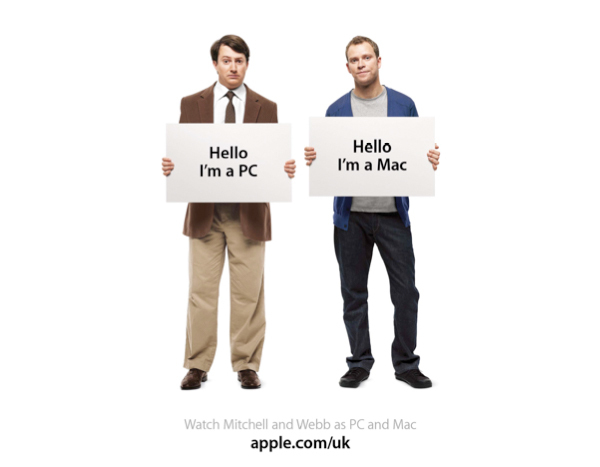 If you enjoyed that you can find a whole host of similar ads in this Get A Mac Ad Campaign Collection YouTube video. Apple have now removed the ads from their site, but they can still be found all over the internet. If you do a YouTube search for ‘Get A Mac’ or ‘Mac vs PC’ you get hundreds of results. The interesting thing is, Mac only own about 7% of the computing market at the moment, that’s only around 2% up on four years ago. Windows however owns more than 90% of the computing market, meaning that most of us have a Microsoft PC. So why is is then that if you scroll down past almost any of the Mac vs PC ads on YouTube you see that the ratio of likes to dislikes is usually around 5:1. This means that if 1,000 people like the ad, just 200 dislike it. So despite most of us choosing to use a PC, we seem to support Apple, rather than Microsoft. The computing industry was once dominated by the Apple-Microsoft rivalry, however in the last 5 years, Google has become a serious contender, making it a three way battle. Google is not only a more viable contender because of its new chrome operating system, but also because its search and other services are so popular. Google has the most websites within the top 100 most visited online of any company in the world. Google.com, Google.co.in, Google.de, Google.com.hk, Google.co.jp and Google.co.uk all ranking among the top 25 most visited sites on the net. Google hold 6 of the 25 most visited sites, whilst Microsoft have just one (MSN.com) and Apple don’t have any. Microsoft have recently tried to mimic Apple’s hugely successful ads, but in order to attack Google. Google is one of Microsoft’s biggest competitors, if not its biggest, so after being ‘slagged off’ in Apple’s ads, it would appear that Microsoft hoped to produce the same effect, but this time with Google in the loosing position. Below I have included one of their ads, entitled Googlighting. UPDATE: Seems like Microsoft realised the ad didn’t quite work… it’s been taken down from their official YouTube channel, however there are a few others still hosting it if you search around. Now I don’t know about you, but I don’t really like that ad. I think it looks like more of a pathetic dig at Google, rather than a cleverly designed way to boost one companies brand, whilst demoting the competitions – as Apple’s ads did. It turns out I am not the only one who didn’t find that ad all that amusing, the ad is published on Microsoft’s own YouTube Channel, and yet has received just 5,117 likes, but a staggering 12,734 dislikes. That is a 5:13 ratio against Microsoft’s ad. So we will stand by Apple when they attack Microsoft, but when Microsoft try to attack Google, we stand by Google. Why? Is it because we see Apple and Google as two trendy, current companies, and Microsoft as an outdated one, which we are loyal to out of convenience not choice? I like Windows 7, but I don’t like Bing, Google has to win for me. iPad vs a Windows tablet, iPhone vs Windows phone, I think I would prefer the iDevice. I thought I should give Google’s ads a mention too. Google hasn’t yet (to the best of my knowledge) made any ads aimed at attacking the competition. Google show very few ads on television, and largely rely on their online dominance to help them promote their products. Something I have found about both Google and Apple’s ads is that they often appear to be very well thought out, and the more modern ones are often extremely well recorded/directed and are very clean. Microsoft’s ads aren’t quite so chic, so is that where their downfall lies? Who Do You Stick By? Personally, I would rather say that I am a Googlite, or loyal to Apple, than say I am loyal to Microsoft. UPDATE: I’m not so sure that I am loyal to Google or Apple anymore – and haven’t developed any more a loyalty to any other competitor either. Use the service which provides the best solution to your needs at the time. Even though I am annoyed at Google, as it hit Technology Bloggers in the Penguin update quite badly, and as far as I am aware (and I have asked in the Webmaster Central forums) we, as a blog have done nothing wrong. In fact we have been doing what Google want, creating great, original content, look at some of the articles Jonny is producing to see awesome, original content, all our writers do, but he is really outstanding at the moment. I am sure we will soon recover, and will continue to strive to be an outstanding blog. Despite being (unfairly) hit, I am still loyal to Google, I believe that in the most part it is a very good, ethical company. UPDATE: I am not quite so loyal to Google anymore, and am less convinced that it is all that ethical. A new philosophy: choose the best device/search engine/browser etc. for the time, loyalty doesn’t seem to pay dividends in the world of technology. What about you though? Who do you stick by? Anyone, or everyone? Great post! I think a big part of why consumers aren’t supportive towards Microsoft is due to security in their products (past and current) and how they are reported ever so quickly across technology blogs. In comparison, Apple viruses prior to Snow Leopard were few and far between but since more and more consumers are switching from PC to Mac there are a vast variety of viruses latching on to OSX. I think Google has the most trust from its consumers as it is more a “web brand” than a “technological one”. This is because before Chrome OS, it created web software which isn’t as easy to attack compared to computer software. If Microsoft stands up to its game and starts building more secure products, I think we’ll see a total change in the next 5 years. Some really good points Jonny! I guess the problem for Apple is that they can boast few/no viruses, however if everyone switches to Apple, so would the hackers, and then Apple would have the problem Microsoft have. At the moment Microsoft has more security vulnerabilities, but you have to keep in mind that it has more than 90% market share as well. Because of this huge market share they are constantly targeted by hackers. However vulnerabilities in Apple are rising everyday and that is in part because there market share is growing. That is true Nishadha, if it was a more equally spread market, Apple would probably just have as many problems as Microsoft with viruses. In my opinion, the main reason why there are a lot of dislikes on Microsoft is that there are more people using it and knows the vulnerabilities of the system. If only the market share between Apple and Microsoft will be balanced, there will be a more reliable comparison between the two. Because Microsoft owned the market for so long they were focussed more on the functionality and the business aspects rather than the user experience. Apple found its USP by focussing more on the creative and home market. These days I think it is more about style than functionality. Do we use Microsoft products out of convenience though? Everyone uses it, so if we don’t we are excluded. I know what you mean about style and functionality, people are too obsessed about how it looks, not what it does! By the way Neil, have you seen our latest competition? It certainly makes it a lot easier to use Microsoft products when Microsoft gives the products away for free. With a lot of computers that you get these days you get a free version of office pre-loaded. I’ll check out the competition. While I would have to agree some companies may have better marketing strategies doesn’t mean they are the better choice. I don’t voice that I am a Googlight, an Apple or whatever the next thing that comes up is anyway. These three companies are not only taking each other on with computers and the software on them, but also on the mobile side of things in cell phones. More and more people are buying smartphones nowadays so obviously this is the future, and as of right now Google holds the lead with Android (at 59%) with Apple following behind at 23%. Microsoft with its Windows Phone is barely there, holding less than 3% of the market share. When people are using certain apps on their phones everywhere they go, they’re going to want to use that same software (for better or worse) on their computer to make things easier. That is why its so important for Microsoft to catch up in the mobile market so it can keep people familiar with its products, which in turn creates brand loyalty. You raise a good point David, the smartphone market is getting more important, whilst the PC market probably less important.